Hello, friends! After celebrating Chatting Over Chocolate's 4th Blogiversary earlier this month, I thought about how fun it'd be to share posts I've published years ago that some of my newer readers might have missed! So, throughout 2017 I'm going to be sharing Throwback Thursday posts with you! 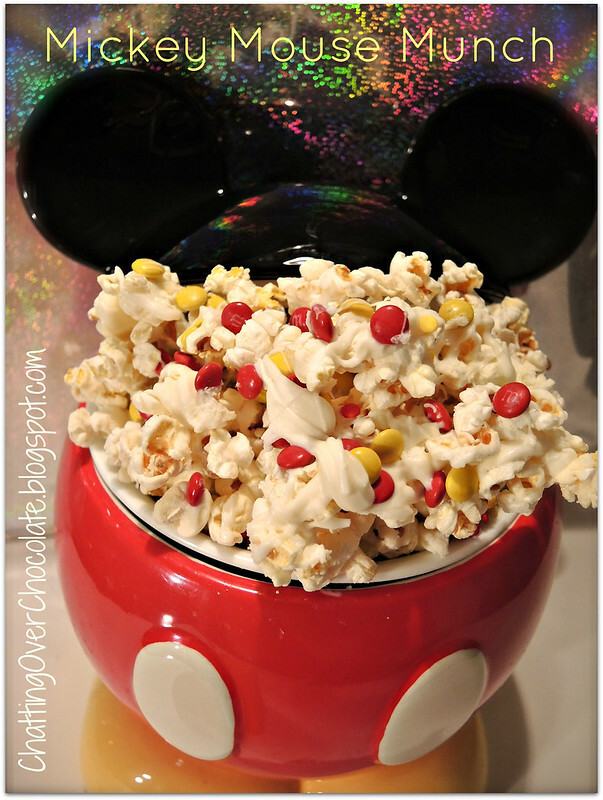 Since today is National Popcorn Day how could I resist kicking off this series with my Mickey Mouse Munch? This recipe was originally published here on February 18, 2013. This was long before I bought my own domain so you'll notice all my photos are marked with "ChattingOverChocolate.blogspot.com". Ahh, memories from my this blog's beginning! Ready to take a tasty trip down memory lane with me? I'll provide the treats! Hiya, Pals! Welcome to another Magical Monday! 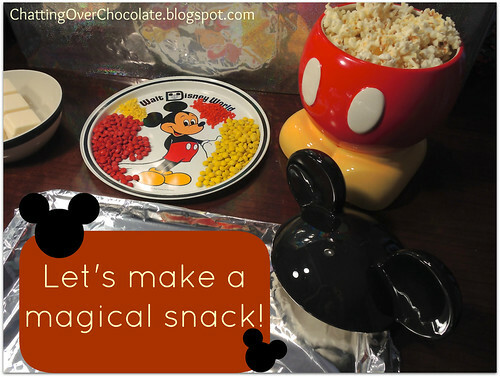 Today I'll be sharing some irresistible Mickey Mouse inspired snackable goodness. 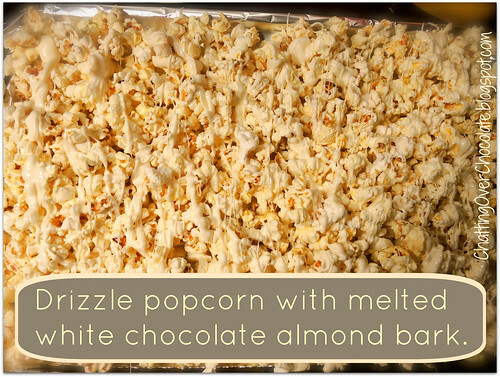 It's an incredibly simple way to turn popcorn into a scrumptious and sweet tooth satisfying treat! This is the perfect snack for your next Disney movie night, family game night, or Mickey Mouse themed party ... it's truly a crowd pleaser! 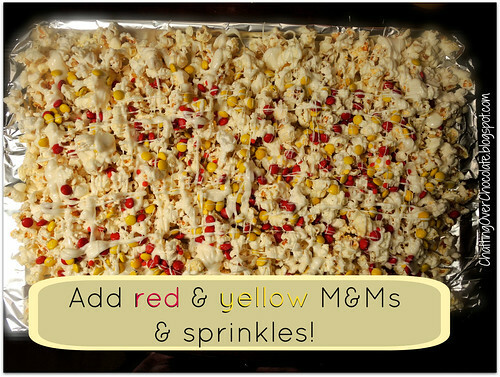 Spread popcorn out on a wax paper or foil covered baking sheet. Let the chocolate drizzled, candy covered popcorn (how great does that sound?!) dry completely. Then break into pieces and ENJOY! All this yumminess and cuteness in one bowl, I'm in girl! What a fun new series and I cannot wait to see all the goodness you brought over the years. 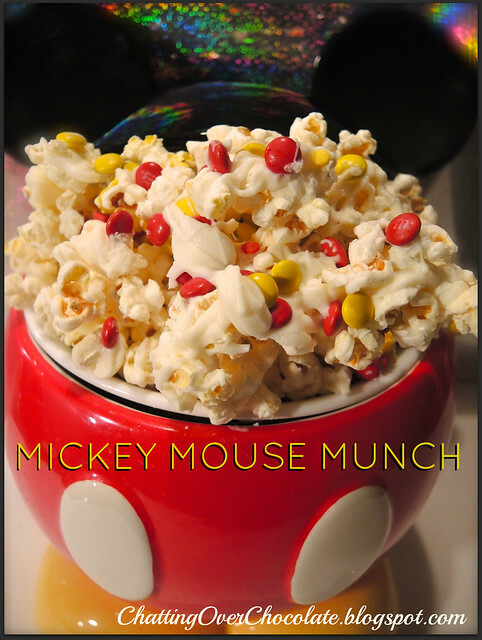 I will take a bowl of this right now thank you, I think Mickey Mouse Munch is the perfect breakfast food, ha ha! Have a great day love! National Popcorn Day!! How fun! Can't wait to share this with my students..they're gonna love it!! It's a thing we do! LOL Love Throwback Thursdays too!! You know we'll be celebrating! What a fun Throwback post! Love it!!!! Oh this looks sooooo delicious and festive right before some Disney fun!